In the title track of her debut CD, In My Hands, Brianna Sage sings, "Everything is in my hands, but can't be planned." A sentiment that encompasses the theme of Sage's music, the Texas native has been performing regularly in New York City since moving here several years ago. Former Police manager Miles Copeland originally signed Sage to a publishing and management deal as a teenager and before they parted ways after the shockwaves from September 11th rippled through the music industry, the pairing yielded an unexpected benefit--- the crossing of paths with Marc Copely, who would both co-write several songs and produce her album. "Miles invited me to his songwriting retreat in France at his castle. There you are paired with different writers everyday and you write a song a day. It wasn't a very big group so you get to know the people there quite well. Marc was also at the castle. Even though we didn't write together at the castle we stayed in touch and when I moved to NYC, we started writing together. I love working with Marc. He pushes me out of my comfort zone and makes me strive to write something better than I normally would." 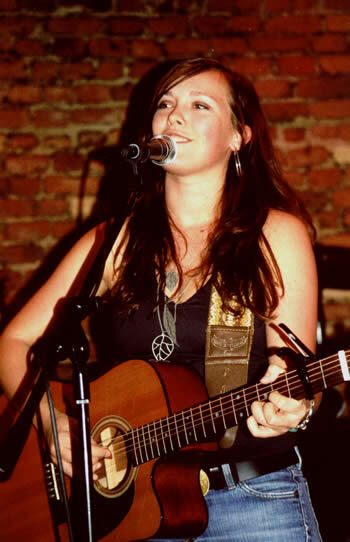 Valuing the experience of collaboration, Brianna Sage has written with several NYC-based artists and songwriters, including Alyson Faith with whom she wrote The Aftertaste and the non-album track, The Letter, a song that beautifully showcases Sage's strong vocal talent. The Letter is about when you've been in a relationship for a little while and you get to that point where you really feel yourself falling for the other person and it scares you. And even though you've been saying "I love you" for awhile, you start to really feel it, " explains Sage. JJ Appleton, Jo Davidson and Jive Jones are among those who have co-written with Sage. "Jive and I wrote Ana together, one of my favorite songs on the record. Writing with him was like a whirl wind. We wrote it so fast and it was exactly what I needed." In addition to seizing the opportunity to write with some of NYC's musical talents, Sage feels that living in in the city has helped to shape her direction. "There is so much talent everywhere that I think it really pushes me to be better, to work on myself and to be the best that I can be. As an artist and a person, I think that it has made me more open to different types of music, situations, lifestyles and people. You can learn something from anyone." Influenced by Sarah McLachlan, Jackson Browne, Tom Petty and Madonna, Sage holds a special appreciation for the power of live music and especially loves the art of performing. "I love touching people with my music. When people hear a song of mine and connect with it, it makes everything worth it for me. Music has helped me through so much in my life and I want to do that for people." Following her recent tour of Borders bookstores in Texas with her percussionist Clancy, Sage is planning a European tour for late Spring 2007 and continues to play locally. Interview originally appeared in IndieSoundsNY (Issue #20 February 2007). Photo by Lauren Jonik. Reprinted with permission.